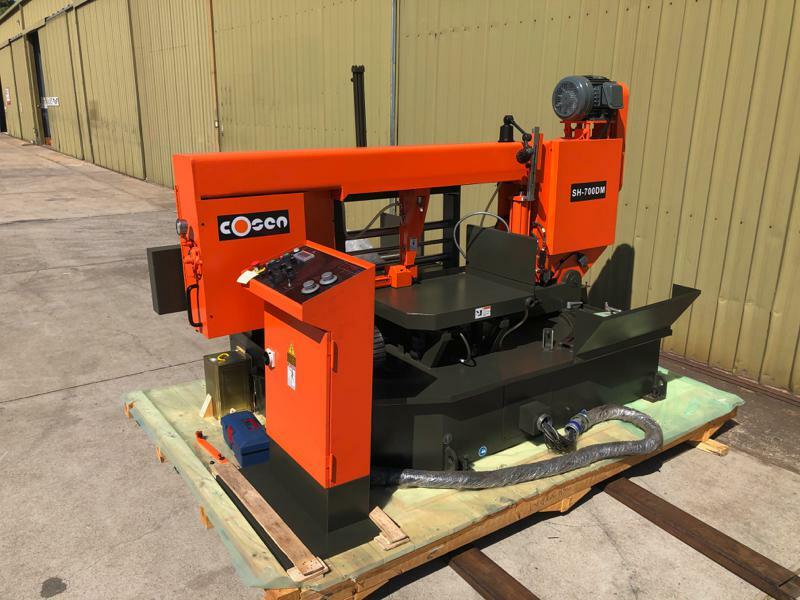 For sale Australia’s favourtie structural steel band saw. 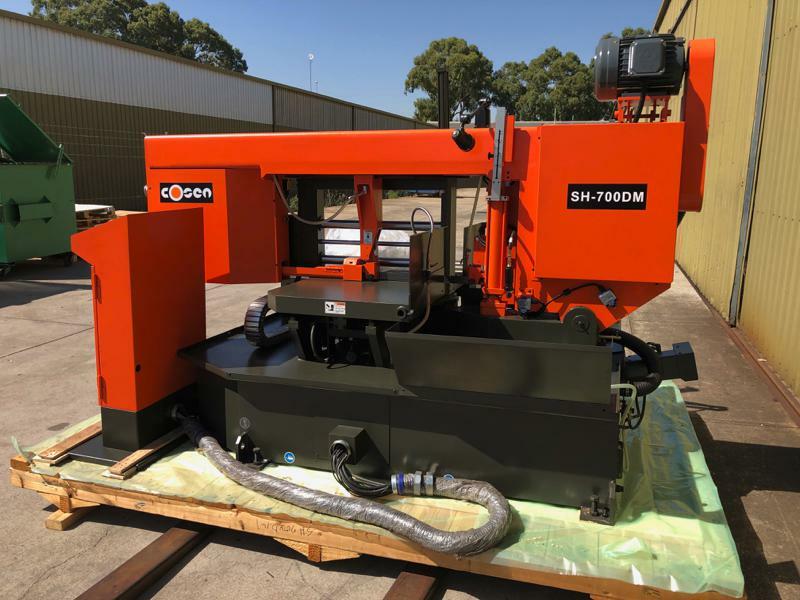 Cosen SH-700DM, capacity 700mm. Suitable for Structrual Steel, H Beam and Steel Fabrication. 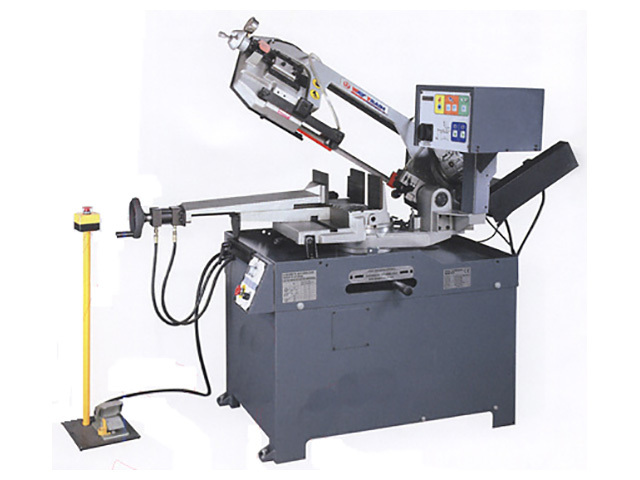 High Quality, Heavy Duty and Affordable Dual Mitre Cut Band Saw. The swivel saw head allows the user to cut at any angle up to 60° in one direction. The precision pivot system facilitates easy and accurate adjustment for angle cuts. Cosen’s SH-700DM has a protractor and pointer in clear view and away from any chips covering the numbers. The infinitely variable-speed blade drive is equipped with the heavy duty worm gear speed reducer. The worm shaft is hardened and ground. Together, they provide quiet, powerful, and trouble-free drive. Cosen offers infinitely variable blade speed system utilizing an inverter drive with the LED Blade Speed Indicator conveniently located on the operator’s station, providing variable speeds from 25 thru 106 m/min to accommodate all types of materials. Carbide guides securely guide the blade during the cutting cycle. The carbide is relieved so that coolant can both cool and lubricate the blade during the cut. The bearing guides eliminate blade stress by pre-aligning the blade before it enters the carbide guides. Two additional guides located on a central axis support the blade from the top, giving it extra penetrating force for faster cuts. Heavy-duty cast iron guide arms are rigidly supported by a large, heavy-duty ductile cast iron dovetail to assure straight cuts and eliminate vibration for longer blade life. Integral coolant system. Coolant is supplied at many critical points: exit & entry of blade through blade guides, middle of cut via adjustable flex hose, and blade cleaning brush. Synchronised power driven blade brush effectively cleans chips from blade to extend blade life. Cosen’s dual valve feed system achieves optimal cutting performance. The operator can easily pre-select the correct feed pressure and feed rate for efficient cutting of any material. The operator’s control station located ergonomically on the front right side of the saw is convenient and user friendly. All operator controls are positioned on the top of the control box and clearly labeled for ease of operation. 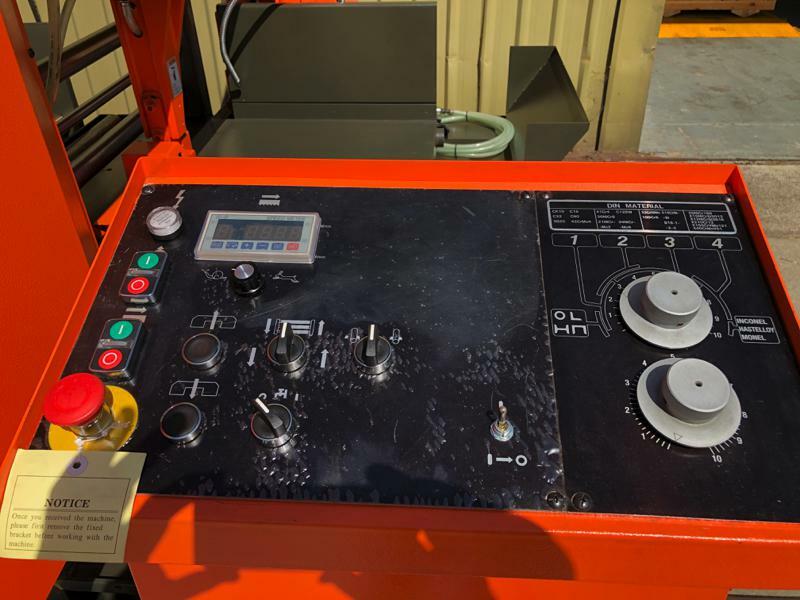 The electrical components are located inside the control box with the main lockout disconnect on the front of the control box for safety and easy maintenance. Work height selector. When the head automatically rises after cut-off, the work height can be preset to allow the head to stop rising just above the material. This timesaving feature is especially useful when making repetitive cuts of the same stock. Cosen uses only heavy-duty industrial rated hydraulic components within a straightforward configuration for easy maintenance. To make maintenance even easier, All components are clearly labeled for identification. Full stroke machine vise. The machine vise incorporates a full stroking cylinder with two guide columns to provide hydraulic clamping of any material from the operator’s station. This eliminates the operator from having to hand position the vise when material size changes. 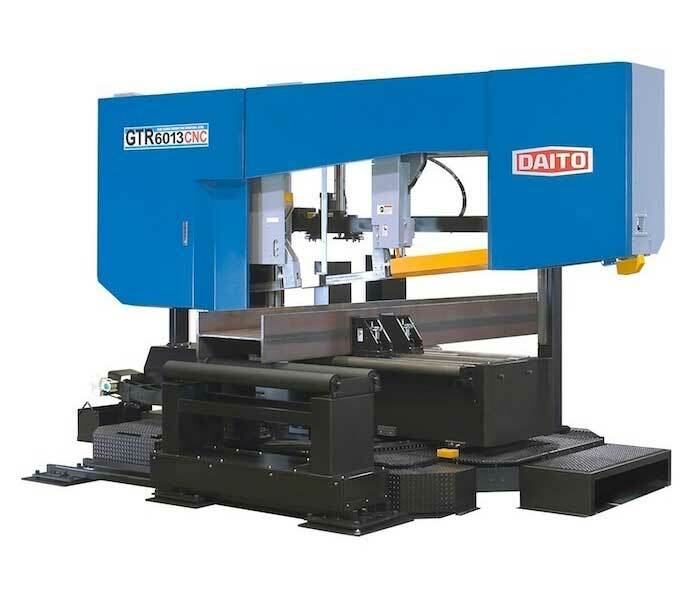 A 620mm solid discharge table with coolant return and a built-in adjustable material stop are standard features that make repeated cutting easy. In addition, productivity is further enhanced with 915mm infeed roller table with plate steel between the rollers. Multiple horizontal rollers located on the entry side of the saw to facilitate smooth material feeding. Proximity switches sense both blade slippage and blade breakage and will automatically shut off the machine if either of these conditions should occur. All blade covers, and guarding on the saw are painted Alert Orange to increase safety alertness. Electrical and hydraulic safety interlock prevents saw blade to start without vises securely clamped. Hydraulic chip conveyor – Hydraulic driven shaftless design allows maximum chip removal rate without worrying about burnt up motor when material falls and binds in the chip conveyor. Vice pressure regulator – Infinitely variable clamping pressure between 0 and full system pressure is easily adjusted and monitored by this device. 3M Powered Roller Table – Combining the chain and the gear-driven power roller table makes material feeding smooth and convenient. The material feed speed can be switched between low and quick modes from the control panel. 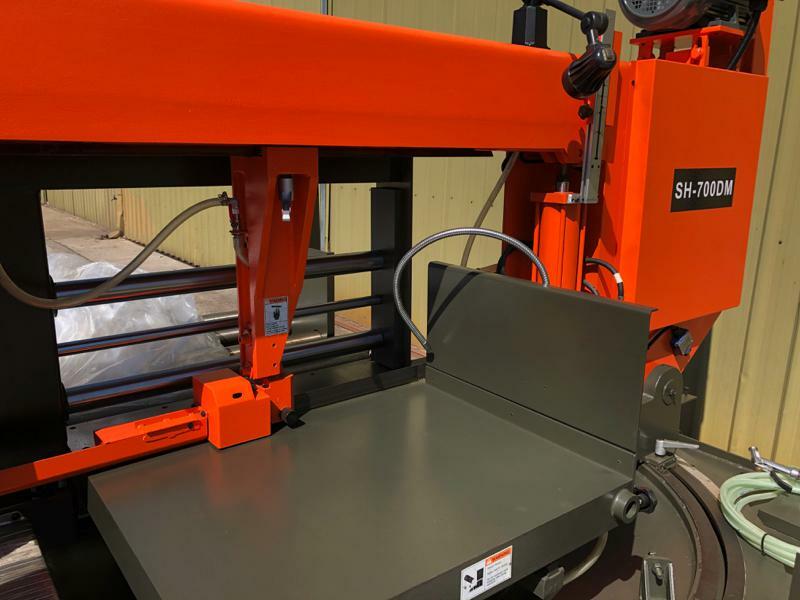 This allows the operator to quickly move the stock into sawing area then finely adjust to the exact cutting position. 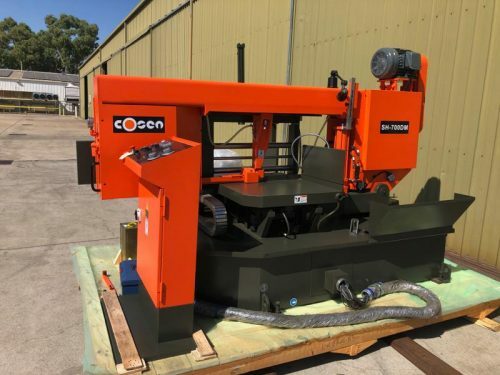 If there is a need for a special option or custom machine, it must be propsed in addition or Cosen provides standard machine only.